Points: 66 Topic: SERIOUS HELP! Sick of my natural hair! HELP!!! Hey Guys, I'm a not so wonderful hair situation at the moment. July 2011, I decided that the relaxer I was doing would be my last in a long time, or my last one EVER. I begun to dislike how thin my hair was after relaxing it & I also started to get those 'Invisible Ends' whenever I combed my hair out. So until this day (3rd Sept 2012) I have not touched relaxer ONCE! I'm so happy!!. I've done this through full weaves, tree braids & right now I have crotchet and weave at the back. So I started this to know what should I do?? I was thinking to texturize it just so its more manageable because I haven't worn my hair out for the past 14 months. I miss the freedom and I'd love to join a hair challenge at some point where I can wash my hair regularly. So please please PLEASEEEE help me out, I'm so stuck right now, Very tempted to relax it but I feel like I've come so far. And I know you can all help me out in some way. I'd appreciate anything. I live in London, so any products that you may suggest I might not have access to. Hey hun there are alot of things you can do if you don't want to go back to the relaxers. If parting your hair is that much of pain it could be that it isn't properly detangled, try a good detangling. Detangling is best when done with a very thick conditioner. For detangling I love the Creme of Nature Detangling Shampoo, even before the conditioner my hair is very easy to comb through. Remember to detangle in sections with a wide tooth comb. If you want to wear your hair out more there are alot of styles you can do while letting your relaxer grow out. You can do twist outs, braid outs, bantu knot outs, etc. Search YouTube for "transitioning styles". If you want to wear your hair out and straight you can also try heat training. A lot of people will tell you to stay away from heat styling at all costs, but there is nothing wrong with it if it is done with the proper products, and is done in moderation like once or twice a month, even weekly if you can do it without damaging your hair. Hello, there are lots of things you can do with your hair. So much great information already posted on this site and many other forums. I hear these stories all the time. To learn your natural hair it takes more than just techniques and products, we have to change our mindset also. 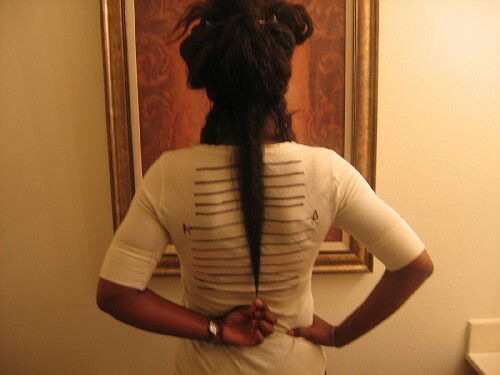 If you truly miss the versatility of relaxed hair, then I say go with your plan to texlax or fully relax your hair. Texlax, which is underprocessing your hair, takes more care than fully relaxed hair. So choose wisely. Think about what your ultimate goal is for your hair on the long term. Once you get a clear goal, focus only on your goal. And doing those things which will get you closer to your goal. It will not be smooth sailing, but you will be happy once you reach your goal and maintain your hair. Blessings!!!!!!!!! Thanks Veemack so is 'texlaxing' hair basically using relaxer but leaving it on for only a few minutes? And if I was to do this or texturize it, do you think I could still reach hair length goals? I mean will lightly chemically treating the hair hinder my hair growth? At the moment, I'm thinking bra-strap length possibly by the end of 2013. Right you leave the relaxer on for a shorter period of time, in hopes that your natural curl pattern will only relax a little and not straight. If you choose this route, it takes lots more care, and can get tricky. Yes it is still possible to achieve your hair goals. As long as you are willing to put in work with your hair. Since you seem frustrated by your hair right now, I do not recommend it. If you choose this route I recommend looking up KISS the creator of that forum she texlaxes her hair. And she transitioned from relaxed to texlaxed. You may see some useful information amongst her articles. I recommend: protein treatments, keep hair moisturized, limit your heat (heat is the main thing to make your hair break when it is relaxed) Opt for rollersets, and updos. Limit your hair braiding, this breaks relaxed hair after a time. Wearing your hair in buns is a good way to help retain your length. These things are a start. Mostly paying close attention to your hair after you put the chemicals in it, to see what your hair needs. I have hair the coils into itself. I learned early in the game to keep my hair stretched and to not let it shrink...ever! I wash my hair in braids and let it dry in those braids. I moisurize and seal in those braids as well. I also like banding my hair to stretch it out. I love it better than when I blow it out with the blowdryer. Have you checked out the Natural Section or the archives? I also had to start retraining my mind. I began looking through the Natural Hair Inspiration thread and hanging out in places where natural hair pictures were posted. That helped me to see the versatility of natural hair and I also began to aspire to recreate some of the styles. GL w/whatever you decide. I have never transition and only lasted 2 months when I tried to do it. Hey Veemack, I'm confused, wouldn't you recommend texlaxing/texurizing my hair if I do find it hard to work with? Maybe you mistyped, i'm not sure. Also where can I find 'Kiss'? as i'm so intrigued into her transitioning. Also I do find it very hard to stay away from braiding because being a student, its so much more manageable to have a full weave/twists/braids as they are like 'get-up n go' hairstyles and also very protective which keeps me away from heat. Most of my hair is natural as I have been gradually trimming off the relaxed ends. Thank you by the way!!!! Such a good idea that braid your hair as you wash! I will be trying that when I wash my hair next. and yes I have had a look at the natural section, they just would let me post the new thread there for some reason. Also, what is 'banding'? and I had a look at that thread, really great. Thank you. What did you do when you said you only lasted 2 months to transition? And your hair is LOVELY!!!! Whatever you're doing, keep it up!!! That is one of the problems with getting your hair texlaxed, is that people do it to make their hair more manageable, but then end of regretting it and experiencing hair loss. I recommended not to do it,because it requires extra care and attention that you may be to aggravated to give right now. Since you said you were frustrated....And I yes I understand about the braids. so I recommend getting a good protein treatment to protect your hair. And keeping it braided or weaved up. But taking it down every 10 weeks and making sure while it is braided that you are washing it weekly and taking care of your scalp. Braids are the easiest for college students in my opinion. But do not get to slack with them. Braid your hair up to take your mind off of it,right now. Think hard before you add more chemicals, because that is permanent. Never do things out of frustration, because sometimes we do not make the best choices when we are at our wits end. Get a protein treatment, coat your hair with shea butter and braid it up. Keep your scalp oiled and wash weekly. Think about the chemicals before you proceed.